I recently got a friend of mine interested in metal detecting by showing him a small gold pin with diamonds I found. He wanted to give it a try. 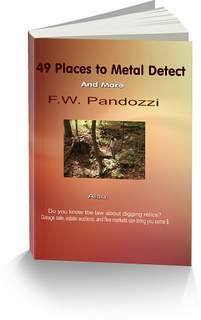 So, I gave him a metal detector and asked him where he wanted to go. I offered a few suggestions on places I thought were good...but he wanted to go to the closest place; where I had searched several times but always come back without anything of value. OK. Let's go. It's his first time out, and I don't think that he's going to persue the hobby if he doesn't find anything interesting, which is surely not going to happen in this park. But we go anyway on his insistance. Upon arriving, I started looking around a tree in the picknick area. To my shock, I unearthed 6 cans...I'm not telling you this because they were valuable. $0.05 * 6 in recycling money (recycle any cans you find) didn't excite me, but I'd never found intact cans before. This was right in the middle of a park??? Tells you what type of people frequent it. My friend and I were both tired of finding pulltabs, cans, and zinc pennies so we went out to one of the 4 ballfields. This place had many clad coins, but nothing of real interest. I thought to myself, "hey, I'll go behind this fence and take a look." so I started walking toward what I thought might be an opening in the fence (small chain link in middle of baseball field) but I kept my detector skimming the ground as I walked. I heard a large ironish target, with discrimination revealing it was more than just a bolt or washer. I dug a bit, and I pulled up a throwing knife! You don't find throwing knives in most parks. This park is obviously not frequented by the nicest crowd. Conclusion: While I have determined afresh that the San Carlos park in San Diego is not good for detecting (in case any of you see this while searching for info on the park,) my friend is really interested now: knives are one of his passions. He later asked, "why didn't I find that?" The funny thing is I went back to that park with the same friend and my brother, and carefully cleaned the area where the knife was found...I mentioned I didn't want to go back to that park, but I though there might have been more knives. Anyway, we turned up some very unique scrap iron pieces, a key, a coin from panama (same shape and face # as U.S. nickle and minted in 2001) and lots of clad. Lets just say 7 hours could have been better spent. I think I'm going to look elsewere from now on...but hey, that knife was a nice find! Ian, thanks for posting your story and the pic. Your story just goes to show people, especially newbies to the hobby, that you never know what your gonna find while your detecting.